NYTimes: But even the most resistant moviegoer may be provoked by ''Ghost Dog.'' Indeed, the best way to appreciate this fascinating but uneven film may be to resist it, to watch it unfold in the persistent, persistently thwarted expectation that it will erupt into the hip-hop Mafia shoot-'em-up it stubbornly refuses to be. There is a lot of violence, but not much action; a plot involving vengeance, jealousy and double-crossing, but not a great deal of suspense. Mr. Jarmusch choreographs his killings with somber stateliness. His blood-drenched climax has an almost ritualistic inevitability, like the end of a Jacobean revenge tragedy or a Kurosawa film. He has composed a ruminative, bittersweet visual essay on brutality, honor and tribalism, which may frustrate audiences expecting hyped-up intensity, fast-paced thrills or a story that makes sense. But frustration can be a stimulus to thought, an aspect of discipline, which is one of the themes of ''Ghost Dog.'' Its subtitle refers to an ancient Japanese warriors' manual called ''Hagakure,'' passages of which fill the screen like intertitles in a silent movie and which also come to us in the gruff, sad voice of Forest Whitaker. Roger Ebert: The whole story is so strange, indeed, that I've read some of the other reviews in disbelief. Are movie critics so hammered by absurd plots that they can't see how truly, profoundly weird "Ghost Dog" is? The reviews treat it matter of factly: Yeah, here's this hit man, he lives like a samurai, he gets his instructions by pigeon, blah . . . blah . . . and then they start talking about the performances and how the director, Jim Jarmusch, is paying homage to Kurosawa and "High Noon." But the man is insane! In a quiet, sweet way, he is totally unhinged and has lost all touch with reality. His profound sadness, which permeates the touching Whitaker performance, comes from his alienation from human society, his loneliness, his attempt to justify inhuman behavior (murder) with a belief system (the samurai code) that has no connection with his life or his world. Despite the years he's spent studying The Way of the Samurai , he doesn't even reflect that since his master doesn't subscribe to it, their relationship is meaningless. 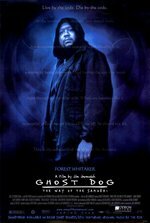 Senses of Cinema: Ghost Dog is a very open film in terms of the racial politics it portrays. White men, as represented by the gangsters, are on a declining path of self-destruction. On the other hand, black men are portrayed as spiritual people, and the creators of a new and enigmatic culture which ironically seems to revolve around the myth of Ghost Dog. Consider, for example, the rap songs and gossiping made around Ghost Dog’s character, and the arcane language exchanged between Ghost Dog and an equally mysterious “Camouflage Samurai” (played by RZA). The film is weird and different and I love it for being so. Like much of Jamusch's movies, it exists in a world not quite our own and deserves to be marveled at for the strange turns it takes. One part I loved was the increasing absurdity of Ghost Dog's invisibility, culminating in his switching license plates between his getaway car and a family sedan, in full view of the family as they sit eating lunch only a few feet away. Been a long time since I saw this, but I remember going in with friends who picked the movie and having no idea what it was, and yes, expecting a hip-hop fueled gangsta exploitation action flick. And then I remember being totally smacked up side the head by the weirdness of it. What I remember mainly from this distance are the odd touches. The mafia don's downsized home, where his Caddy won't even fit in the garage so the back end sticks out and they can only put the garage door partway down. But my favorite part is the scenes with the ice cream vendor, where they have no language in common but still have this friendship and these long conversations that align and intersect in odd ways. The book Ghost Dog quotes, is called a made up book in one of those links, but it's not. It's the Hagekure of Yamamoto Tsunemoto, a grumpy C17th 'get off my lawn' memo written by an aging Samurai who was distinctly unimpressed at the dearth of death-hungry fanaticism in the young folks nowadays. Interestingly the author never actually did any of the badass samurai things he wrote about. One of my faves, and I think it's my favorite Jarmusch, I watch it at least annually. I liked "The Limits of Control" for a lot of the same reasons, but "Ghost Dog" is so much cooler. I have not been able to get through the Hagakure more than a couple dozen pages, but I can see how it could be a code. OK, to add to the weirdness, Ghost Dog is one of the few movies to get a role-playing game book, back when Guardians of Order were doing rpg/resource books of various anime. According to a reviewer, the studio approached the game company to do it. Go fig. Ah-yeah! I have a copy of that game! Weirdly, they had mechanics for running an entire Mafia campaign, not just being street samurai. I have to think that RZA, who is a big gamer, had a role in that game getting produced.